The Bharatiya Janata Party (BJP) on Tuesday pulled out of its alliance with the Peoples Democratic Party (PDP) in Jammu and Kashmir saying it had become impossible to continue in the government in view of the growing radicalism and terrorism in the state.Immediately after this, senior PDP minister and party’s chief spokesperson Naeem Akhthar told reporters in Srinagar that chief minister Mehbooba Mufti would be submitting her resignation to Governor N.N. Vohra.The decision to quit the J&K government was taken after consulting Prime Minister Narendra Modi and BJP chief Amit Shah, the party’s general secretary Ram Madhav said at a press conference in New Delhi. The development raise the possibility of governor’s rule in Jammu and Kashmir, the eighth time since it was first imposed in 1977.Madhav himself said the party favours governor’s rule. The BJP blamed the PDP for failing to improve the security conditions in the Kashmir Valley. Madhav cited last week’s killing of senior journalist Shujaat Bukhari in the heart of Srinagar in the highly secured area of Press Enclave by unidentified gunmen. The same day—two days before Eid—an Indian Army soldier Aurangzeb was abducted while going on Eid leave and killed.“It has become untenable for the BJP to continue in the alliance government in the state,” Madhav said at the press conference after a meeting with J&K BJP leaders and ministers summoned to the national capital on little notice. “Keeping in mind that Jammu and Kashmir is an integral part of India and in order to control the prevailing situation in the state, we have decided that the reins of power in the state be handed over to the governor,” Madhav said. Terrorism, violence and radicalism have risen and the fundamental rights of citizens, including right to life and free speech, are in danger, the BJP leader said. In 2015 J&K elections, the BJP won 25 seats and the PDP 28 in the 87-member assembly. The two parties came together to form the government with an Agenda of Alliance.BJP leader and deputy chief minister Kavinder Gupta told reporters in Delhi that he and his ministerial colleagues have submitted their resignations to the governor as well as to the chief minister.The decision to withdraw support came after BJP president Amit Shah met with the party’s lawmakers from Jammu and Kashmir in Delhi. “Centre did everything for the Valley. We’ve tried to put a full-stop to the ceasefire violations by Pakistan. The PDP has not been successful in fulfilling its promises. Our leaders have been facing a lot of difficulties from the PDP in developmental works in Jammu and Ladakh,” Madhav said. 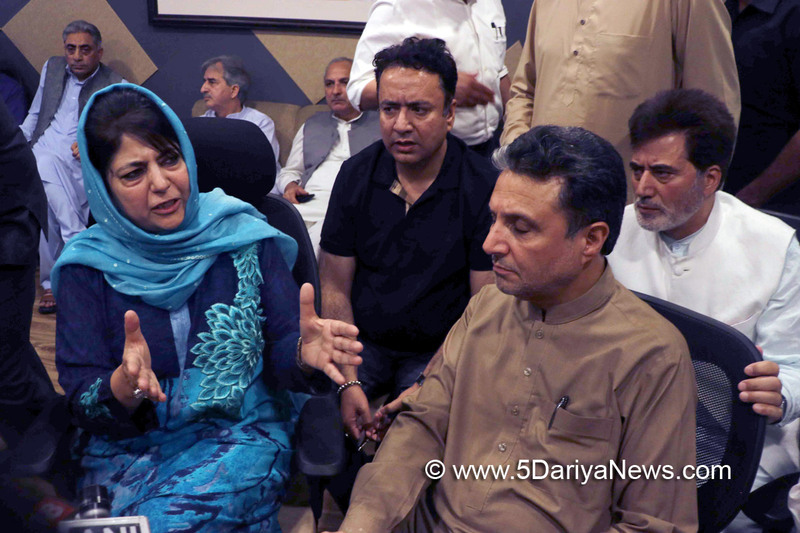 “We are not questioning the intentions of the PDP, but they have failed in improving the condition of life in Kashmir,” he added.Meanwhile, the Congress, which has 12 seats in the J&K assembly, said there is no question of an alliance with the PDP. The BJP had committed a “Himalayan blunder” by forming a government with the PDP, said Congress leader Ghulam Nabi Azad, adding that a national party and a regional party should have never allied. “The regional parties should have been allowed to form an alliance among themselves,” he told reporters. The alliance has devastated the state, be it economically or socially, and has left Jammu and Kashmir in a state of “ruins”, Azam added. Jammu and Kashmir Pradesh Congress Committee said the PDP-BJP coalition was destined to break as it was an “unholy” alliance. “This was an unholy alliance and it was expected to break from Day 1. They had betrayed the people of the state and supporters of the respective parties. They sought votes on opposing agendas,” PCC president G.A. Mir said.The BJP was more responsible for the situation in Jammu and Kashmir than the PDP as the national party carried more weight in the coalition. “The BJP had a big mandate at national level but they were policy less when it came to Jammu and Kashmir,” added Mir. Delhi chief minister Arvind Kejriwal slammed the BJP over its decision to pull out of its alliance with the PDP in Jammu and Kashmir and alleged that the party had “ruined” the state. The chief minister also brought up the issue of demonetisation in a series of tweets following the BJP’s announcement. “After ruining it, BJP pulls out of Kashmir. Didn’t BJP tell us that demonetisation had broken the back of terrorism in Kashmir? Then what happened?” Kejriwal said.